Family Channel / Nine Network. 65 x 60mins. 1993-97. Executive Producers: Richard Becker, Russell Becker. CD (ST) Polygram. 21195. 1995. 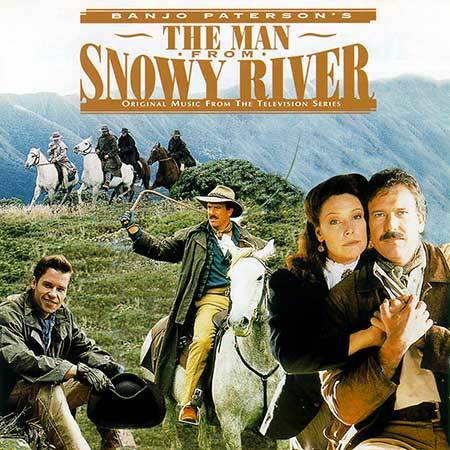 "BANJO PATERSON'S THE MAN FROM SNOWY RIVER ORIGINAL MUSIC FROM THE TELEVISION SERIES". Tracks 1 & 25 Frank Strangio Licenced from PRP Films (No 3) Pty. Ltd. Warner Bros Music Australia Pty. Ltd. Trading as Warner Chappell Music Australia. Tracks 2 to 22 Peter Sullivan Licenced from PRP Films (No 3) Pty. Ltd. Sully Music (Australia) Pty. Ltd. Track 23 performed by Noel Watson courtesy of "Waltzing Matilda The Centennial Album" (Mercury 528034.2). Track 24 Leonard Teale - Reading "The Man From Snowy River" EMI Music Publishing Australia Pty. Ltd. Banjo Paterson (P) Sony Music Entertainment (Australia) Limited. Licenced from Sony Music Entertainment (Australia) Limited. Digitally Mastered by Don Bartley and Dave Macquarie at Studio 301 Sydney. Album Compilation and Supervision by Clive Hodson. Theme From The Man From Snowy River. The Warmth Of The Irish. Being A Part Of The Land. The Secret Of The Snowy. The Gathering Of The Spirits. At One With The Land. Waltzing Matilda. v: Noel Watson. The Man From Snowy River. v: Leonard Teale. Theme From The Man From Snowy River (Reprise). CD(t) (OP) (See COMPILATIONS - FRANK STRANGIO - A FILM MUSIC COLLECTION: Tks 18-20).